Home » WOD Blog » Tooz-day. *First 3 sets at 75% of 3 RM, last 2 sets at 80% of 3RM- DO THE MATH BEFORE YOU COME IN! Notes: Reverse walking lunges may be done in place. 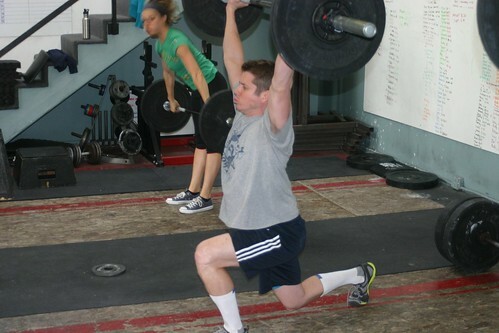 Lateral burpees are performed with a lateral jump over the barbell. Each time over the bar counts one rep.
For many of you that struggle with the overhead position either from tight ankles, hips, or thoracic spine, today you can get the benefits of the exercise (improved core stability) without being penalized for your lack of mobility. No need to pay someone $500 to watch the Crossfit Games anymore! The “limited access” spectator passes have been released! Click here for details and purchasing info. I’m thinking a viewing party of our own….any suggestions?